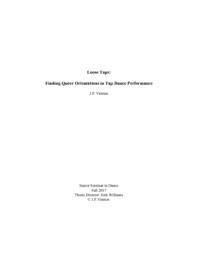 This thesis seeks to answer the question, “Where is queer tap dance?” Drawing from work in queer studies and tap dance history, I search for moments in tap dance performance where tap has been loosened from heteronormative conventions. “Loose Taps” is divided into two acts. The first act examines two numbers that mobilize crossdressing to explore more fluid masculinities: “Expressing Yourself,” from the popular musical Billy Elliot, and Caleb Teicher’s Not So Impossible. A brief intermission theorizes the queer potential of musicality in Lindy Hop, a parallel jazz dance form. In the second act, I study “Turn it Off” from Book Of Mormon and Josh Hilberman’s The Warrior, two choreographies that exaggerate tap’s spectacle and sound to approach a queer themes. In writing this thesis, I hope to open up the floor to further research into queerness and tap dance.